Watermelon, (Citrullus lanatus), succulent fruit and vinelike plant of the gourd family (Cucurbitaceae), native to tropical Africa and cultivated around the world. The fruit contains vitamin A and some vitamin C and is usually eaten raw. The rind is sometimes preserved as a pickle. The history of watermelons is a long one. There is a Sanskrit word for watermelon, and fruits are depicted in early Egyptian art, indicating an antiquity in agriculture of more than 4,000 years. Domestication and selective breeding have resulted in intensely sweet large fruits with tender flesh and fewer seeds. Some modern “seedless” cultivars have almost no viable seeds. 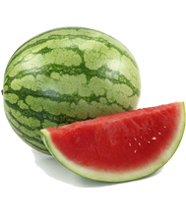 The watermelon plant is an annual that grows well in hot climates. Its vines grow on the ground and have branched tendrils, deeply cut leaves, and flowers borne singly in the axil of a leaf (e.g., where the leaf joins the stem). Each light yellow flower is either male or female, producing only pollen or fruit, respectively.